Herbaland is getting a fresh new look so you may receive the package shown above or the following. All ingredients have remained the same. Calcium is an essential mineral that plays an important role in the development and maintenance of bones and teeth. The addition of vitamin D, which helps the body absorb and use calcium, is also necessary for building strong bones in growing children. 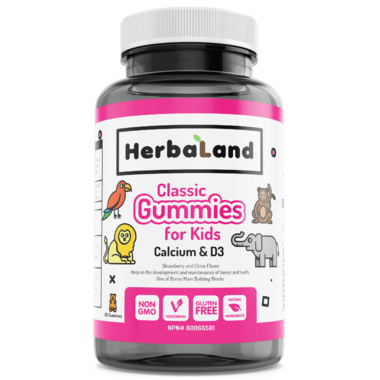 Herbaland Kid’s Gummy Calcium with Vitamin D3 has been specially formulated in great-tasting natural fruit flavors. 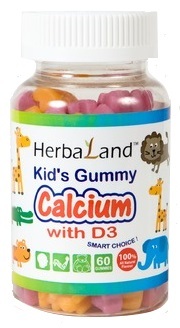 It is a great way to help your children meet their daily calcium and vitamin D requirements. Aged 2-4: take (2) two Gummies per day orally. Aged 4 and older: take (1) one Gummy (3) three times per day orally. Take a few hours before or after taking other medications. Glucose Syrup, Gelatin, Purified Water, Citric Acid, Natural Colors (Black Carrot, Annatto), Natural Flavors (Strawberry/Banana, Orange/Peach, Green Apple), Vegetable Oil, Carnauba Wax. Kids love them. Great product!